Patio weddings are a staple of the summer season. How many invites do we receive from friends and family throughout the year asking us to RSVP between the months of May and September? You might only see one or two but that’s one or two among hundreds going on within a five-month window of sun, soft breezes, and hopefully, clear skies. 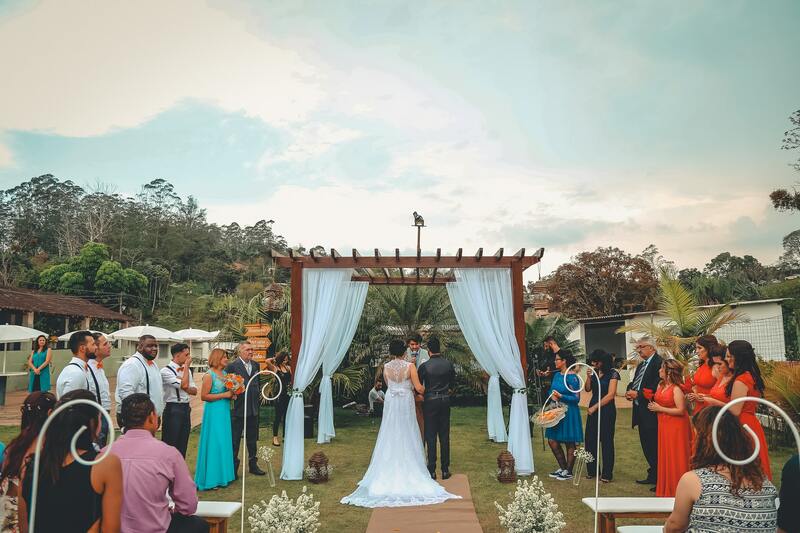 Even if the weather isn’t as accommodating as a couple would like, they can still have a beautiful backyard ceremony and reception if they plan for it. There’s no reason to let some unexpected rain or overly hot day ruin one of the best moments of your life. Never trust the forecast or discount your great aunt Becky’s stiff right knee. Don’t wave away possibilities because you want your day to be perfect. Old bones can be right and the local weather forecast, as we all know, can be so often very wrong. All you can do is make a plan for the chaos that is inevitably going to affect your special day, at least a little bit. From great locations to stay dry to the patio umbrellas you’ll need, here are some things to think about when planning your outdoor wedding. When we’re talking about outdoor weddings, this pesky problem deserves its own section. If you’re the kind of couple that wants a winter wedding or a destination wedding somewhere tropical, your loved ones may be safe from the terror of pollen and other allergens. However, those looking to tie the knot in a garden, the woods, or anywhere else chock full of sneeze-inducing allergens, it would behoove you to consider your guests. While most people with allergies have been through this song and dance before and can probably take care of themselves, that doesn’t mean you can’t help out. – Did you know that pollen counts are highest first thing in the morning? Consider a ceremony in the afternoon. – Maybe you want a lakeside wedding or a ceremony near the ocean? Perfect! Since the wind off lakes and oceans has a lower pollen count, your allergy cursed guests will no doubt thank you for the choice of location. The view certainly won’t hurt either. This is where the dream becomes reality. Here, you’ll exchange rings and wedding vows while friends and family look on, tears in their eyes, and wind in their hair. Unless, of course, a light breeze is swapped for unbearable heat, a sudden rainy downpour, or, if the season warrants it, a slushy snowfall. In cases like these, the ceremony becomes less about watching two people in love than it is about trying not to get soaked or burnt. Tent weddings are beautiful and can meet a variety of aesthetics. Whether you’re looking for a rustic atmosphere or a high-class vibe, this is a great option to keep your guests covered in style. Harsh, heavy rain will need something hardier than gossamer fabric, but a flowy tent will still keep the heat at bay. If you want to keep the ceremony in the open air, it doesn’t have to be entirely free of coverage. While the bulk of the seating might be exposed to the elements, consider patio umbrellas with sunbrella fabric scattered around the edges of the location. This way, standing guests and anyone who’s feeling uncomfortable sitting can get some relief without missing anything. Sunbrella is a beautiful option when you need amazing looking fabrics that will fit your color scheme while providing immaculate shade and protection. Best of all? They’re excellent at blocking UV rays and are approved by the Skin Cancer Foundation. Once the pair has been wed, it’s time to party! When you’re having an outdoor ceremony, the option of moving indoors for the reception can be tempting. There’s a roof over everyone’s head, the venue will most likely have bathrooms and ample seating, and on those hot days, it’s great to know there’s a building with air conditioning waiting. However, this is all about outdoor weddings and that includes the reception. As mentioned above, tent weddings are a fantastic choice to keep the entire event outdoors. The reception is really what we think of when it comes to tent weddings. Pretty lights around a tent of light fabric with chair and tables set up underneath it all. We can all imagine it and rarely would anyone say it’s not a gorgeous way to go. There are always spots you can take advantage of when nature gets wild, but you or the photographer need to know the location to be from scrambling. You can’t plan for everything, but that doesn’t mean you shouldn’t try to cover the things that might ruin an outdoor wedding. Taking time to consider the above will keep stress levels low on an already stressful day. Keep aunt Becky out of the rain, help your sneezing brother get some relief, and you can keep just a bit saner on this most momentous of days.